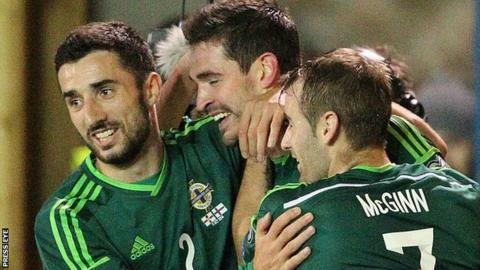 Northern Ireland beat the Faroe Islands to make it two wins from two games and move to the top of Euro 2016 qualifying Group F - their best start to any campaign since 1968. Gareth McAuley got on the end of Chris Baird's headed knock-on from a corner to fire a low shot home on six minutes. Kyle Lafferty added the second when he flicked in after running onto Shane Ferguson's well-executed delivery. Roy Carroll saved Frodi Benjaminsen's penalty 10 minutes before half-time. The victory means Michael O'Neill's side travel to face Greece on Tuesday with a perfect record, having beaten Hungary in their opener last month. Northern Ireland had been held to a draw twice in four previous meetings with the Faroes but a sixth win in 41 competitive games always looked on the cards thanks to two goals in the opening 20 minutes. McAuley's drilled right-foot effort for his fifth international goal was just reward for the hosts' early pressure and Lafferty almost made it two, but the Norwich striker was unable to make enough contact with Ferguson's fine right-foot cross from the left. Conor McLaughlin's cheeky back-heel from a corner was saved by Gunnar Nielsen and home skipper Steven Davis twice fired over the bar. Lafferty chalked up his 11th goal for his country and, soon after, Jamie Ward's long-range right-foot effort whistled wide of the target. Northern Ireland lie 108 places ahead of their opponents in the Fifa rankings and their superiority was emphasised as they continued to lay siege on the visitors' goal. Lafferty was denied by a diving save from Nielsen, Niall McGinn tested the goalkeeper with a drilled attempt and the impressive Lafferty also headed just wide. The Faroes had an opportunity to reduce their deficit when Ferguson brought down Joan Edmundsson inside the area, but Carroll dived low to his left to push Benjaminsen's spot-kick onto the post. The second half was a tepid affair and O'Neill's charges could only conjure up a couple of chances, Nielsen palming an Oliver Norwood piledriver onto the bar and defender McLaughlin skewing a great chance wide. Brighton winger Pat McCourt, the two-goal hero when the sides last met in Belfast in August 2012, was unable to make the same impact after being introduced as a substitute. Lars Olsen's outfit remain pointless, while Northern Ireland are two points clear of Finland and Romania, who drew 1-1 with Greece and Hungary respectively. Chris Brunt is not expected to make the trip to Greece after being ruled out of Saturday's match in Belfast with a groin injury sustained in training. Match ends, Northern Ireland 2, Faroe Islands 0. Second Half ends, Northern Ireland 2, Faroe Islands 0. Foul by Paddy McCourt (Northern Ireland). Substitution, Faroe Islands. Kaj Leo i Bartalsstovu replaces Pol Johannus Justinussen. Attempt blocked. Jamie Ward (Northern Ireland) right footed shot from outside the box is blocked. Assisted by Shane Ferguson. Offside, Northern Ireland. Oliver Norwood tries a through ball, but Jamie Ward is caught offside. Attempt blocked. Hallur Hansson (Faroe Islands) right footed shot from outside the box is blocked. Pol Johannus Justinussen (Faroe Islands) wins a free kick on the left wing. Sonni Nattestad (Faroe Islands) wins a free kick in the defensive half. Corner, Faroe Islands. Conceded by Oliver Norwood. Corner, Faroe Islands. Conceded by Jamie Ward. Foul by Chris Baird (Northern Ireland). Klaemint Olsen (Faroe Islands) wins a free kick on the left wing. Substitution, Faroe Islands. Klaemint Olsen replaces Christian Holst. Attempt saved. Jamie Ward (Northern Ireland) right footed shot from outside the box is saved in the bottom right corner. Pol Johannus Justinussen (Faroe Islands) wins a free kick in the defensive half. Substitution, Faroe Islands. Arnbjørn Hansen replaces Páll Klettskard. Roy Carroll (Northern Ireland) wins a free kick in the defensive half. Corner, Faroe Islands. Conceded by Luke McCullough. Substitution, Northern Ireland. Paddy McCourt replaces Niall McGinn. Attempt missed. Conor McLaughlin (Northern Ireland) right footed shot from the centre of the box misses to the left. Assisted by Niall McGinn. Attempt missed. Kyle Lafferty (Northern Ireland) right footed shot from the centre of the box is high and wide to the left. Assisted by Jamie Ward following a corner. Attempt missed. Jamie Ward (Northern Ireland) right footed shot from the centre of the box misses to the left. Assisted by Oliver Norwood with a cross following a corner. Corner, Northern Ireland. Conceded by Jónas Thór Naes.